Shirley Chisholm, Democratic Congresswoman seeking the nomination for president, makes a point during a speech in San Francisco on Tuesday, May 16, 1972. Photo via AP Images. If Hillary Clinton is declared America’s first female president tonight, it’ll be thanks in no small part to decades of groundwork by generations of women. Among them: Shirley Chisholm, the first African American woman to run for president as a major party candidate. Even with the field narrowed, Chisholm still struggled to get votes even from her supporters. One woman told the Tucson Daily Citizen, “I would like to be able to afford a vote for Shirley Chisholm, but I can’t. I want someone who will beat Nixon.” The same article in the Tucson Daily Citizen described a 50-something year old woman actually wearing a Chisholm for President button who still hadn’t decided who to vote for. She championed a bill to ensure domestic workers received benefits, was an advocate for improved access to education, and fought for the rights of immigrants. She sponsored a bill to expand childcare for women, supported the national school lunch bill and helped establish the national commission on consumer protection and product safety. 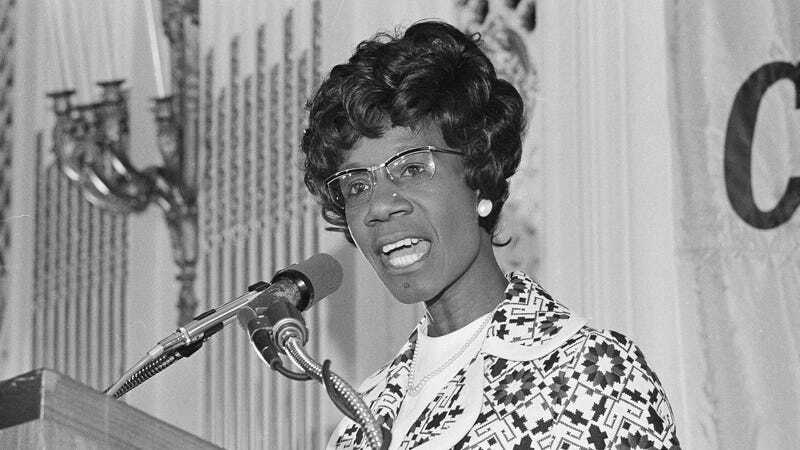 Shirley Chisholm also worked tirelessly to expand the government-funded food stamps programme so it was available in every state, and was instrumental in setting up an additional scheme, The Special Supplemental Nutrition Program for Women, Infants and Children (Wic), which provided support for pregnant women. But she was openly critical of the House leadership for failing to make adequate progress on social programs. In 2015, she was posthumously awarded the Presidential Medal of Freedom by Barack Obama. Members of the National Women’s Political Caucus tell a Washington news conference on July 12, 1971 one of their goals is that women comprise half of the delegates to the 1972 presidential conventions. Seated from left: Gloria Steinem, member of the Democratic National Policy Council; Rep. Shirley Chisholm, D-N.Y.; and Betty Friedan, women’s rights advocate. Standing is Rep. Bella Abzug, D-N.Y. Photo via AP Images.